At least 25 people have been killed by a fire that swept through a clothes factory near the Bangladeshi capital Dhaka, officials say. At least 45 people were also hurt in the blaze, which raged for five hours before firefighters put it out. 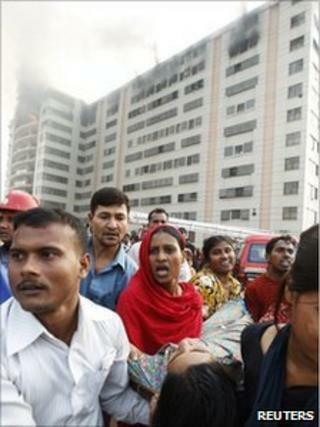 Dhaka police said some people had been killed jumping from the 11-storey building to escape the flames. The police said an electrical fault was the likely cause for the fire in the Ashulia industrial zone. Rescue crews are finishing off their search for bodies at the factory. Home Minister Sahara Khatun has visited the site and told the BBC Bengali service that the fire was "a tragedy". Officials have warned that the number of dead could rise. "All of them died either jumping from the 10th floor of the building or while trying to climb down to escape the fire," said Iqbal Bahar, of Dhaka police. The emergency services say that they have now reached the top floor and the worst of the flames have been extinguished. "We are now in control," Mr Bahar said. Bangladesh has about 4,000 garment factories that export more than $10bn (£6bn) worth of products a year, mainly to the US and Europe. More than 10,000 people work in the huge factory complex owned by one of the country's largest exporters, the Ha-Meem Group. Officials from the firm said many of the workers had been out at lunch when the fire started, or the casualty figures could have been much higher. Police sub-inspector Mostofa Chowdhury told the AFP agency that some workers had complained that emergency exits from the building were locked. "Some were injured in a stampede [to escape the building], some inhaled too much smoke, I saw at least six people jump from the roof," he said. The BBC's Ethirajan Anbarasan in Dhaka says that frequent accidents in factories have triggered calls for more inspections to check fire safety in large industrial units. Fires caused by short circuits and sub-standard electrical wiring are common in Bangladeshi garment factories, which often have inadequate fire escapes. Mr Bahar said his initial investigations suggested that the fire was caused by a short circuit.